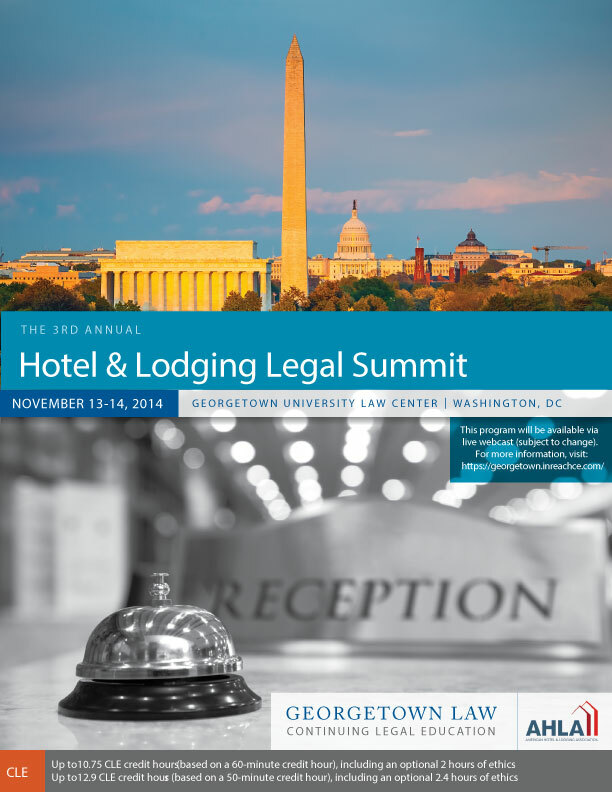 This year, it is again my privilege to co-chair the Hotel & Lodging Legal Summit, co-sponsored by Georgetown University Law Center and the American Hotel & Lodging Association. We have an outstanding agenda this year. Notably, among our many distinguished speakers are the chief legal officers of 7 prominent hotel companies. There are a few items I would like to discuss related to our planning of this year’s conference. As with the last two events, we began planning this year’s conference by consulting our Advisory Board of over 35 prominent attorneys in the hotel and lodging industry. We believe our Advisory Board best represents the groups of lawyers served by this conference, so we begin by asking which topics keep them awake at night. This year, we collected 47 topic suggestions and put them to a vote among Advisory Board members. From the results, we selected 8 topics for the conference, which we will explore in 10 sessions over a 2-day period. The topic that generated the strongest interest was guest data security. We had explored the related subject of data privacy laws last October. Not long after that conference, Target Corporation’s credit card breach was discovered and received much publicity. On a much smaller scale, but within hotel industry, White Lodging Services Corporation had a similar experience. These incidents undoubtedly generated interest in continuing discussion of security of guests’ personally identifiable information—particularly their credit card numbers. In response to this interest, we are beginning the conference with a panel of noted experts, including representatives of the FBI and the Federal Trade Commission, who will address legal challenges related to data security. Another topic that drew strong interest was current union activities. Interestingly, the most outspoken interest in this topic seemed to come from hotel owners represented on our Advisory Board, rather than the management companies that employ hotel workers who can collectively bargain (although they also expressed interest in the topic). Significant collective bargaining activities have been taking place in New York City this year, which are expected to influence union activities within the hotel industry nationwide.& We responded with a panel of prominent labor attorneys who will explore issues related to current union activities. In response to strong interest within our Advisory Board, we’re exploring a few topics for the first time this year. For example, two of our breakout sessions will offer attorneys a crash course in accounting and financial principles, first as applied in any business and second as applied in foundational contracts in the hotel industry. Another panel will explore legislation pending on Capitol Hill and in state legislatures that is of interest to the hotel and lodging industry. Another will explore legal issues related to digital marketing and social media, both of which are of increasing importance to this industry. We received very positive feedback from attendees for having a luncheon speaker last year. This year, we are honored to have AHLA President Katherine Lugar as our luncheon speaker. As I noted in one of my earlier blog posts, we also received some constructive criticism of last year’s conference. Most significantly, we were strongly advised to make a more concerted effort to balance our panels with representation of different constituencies within the industry that have different perspectives on various issues. In response to that criticism, we have made particular efforts to ensure input and representation of three constituencies: hotel owners, independent (non-branded) management companies and smaller (often family-owned) franchisees. For example, for a discussion addressing subordination and cash management agreements, we have assembled a panel that includes in-house attorneys with a hotel owner, a branded management company and an independent management company. On our panel addressing franchising issues, two of the panelists are lawyers who represent franchisors and two represent franchisees. At least one of the franchisees’ lawyers often represents small, family-owned businesses in the industry. Meanwhile, we are honored to have a representative of the Asian-American Hotel Owners’ Association (AAHOA) on our panel addressing legislative matters. We’re making an effort to increase attendance at this year’s conference. If you work in an office with several attorneys who serve the industry, please note that we’re offering significant group discounts this year. If you know others who may be interested in attending, please feel free to copy the above URL and forward a link to this post to them. Also, please do not hesitate to contact me if you have any questions about the conference.